Drought and conflict are combining to potentially create another summer of famine threatening the lives of millions. The U.S. just pledged 50 million dollars in aid for drought hit areas. It is clear though that more donations from the entire international community will be needed. The UN World Food Programme (WFP), the largest food aid agency, is currently experiencing huge funding shortages in East Africa. WFP said in a report last week that its 12 month shortfall for the region is $408 million. WFP revealed this week that “assessment findings in Buhoodle, Somalia, indicate very high levels of food insecurity.” Somalia has been hardest hit by the hunger crisis since last year. But so too are its neighbors which have taken in many Somali refugees, as well as contending with hunger among its own population. Refugee camps in Ethiopia, where many Somalis fled after famine struck last year, also revealed that about 24 percent of the population have borderline or poor food consumption. A drought emergency has been taking place for months in the Sahel region of Africa. This region includes the countries of Niger, Mali, Mauritania, Chad and Burkina Faso. Following a U.S. donation late last month WFP needs about 300 million dollars for its relief activities throughout the Sahel. There are positive signs such as Canada and the U.S. making donations to help start a biscuit factory in Kabul. This helps increase food production in Afghanistan, benefiting farmers, schools and shops. The biscuits are a part of WFP’s nationwide school feeding programs. More food security projects like this are needed within Afghanistan. Until hunger and malnutrition are dealt a significant blow, the country will not achieve peace or development. In South Sudan, the World Food Programme “faces a significant financial shortfall of US$145 million.” The country is reeling from conflict with Sudan as well as internal fighting in the Jonglei state between the Lou Nuer and Murle tribes. Drought has ruined crop production and around 4.7 million people are facing hunger. Should conflict escalate, famine could strike South Sudan. In Yemen, the fight against hunger is key for the country to build internal stability and develop. The country has suffered the last two years through political unrest and fighting in the South between Al Qaeda and the government. The World Food Programme says that 22 percent of the population now suffers from severe hunger. WFP though is short nearly 50 percent of its funding requirement to help Yemen fight hunger. The growing hunger crisis is going to require the U.S. to build up its Food for Peace program, which is critical for saving lives and improving global stability. 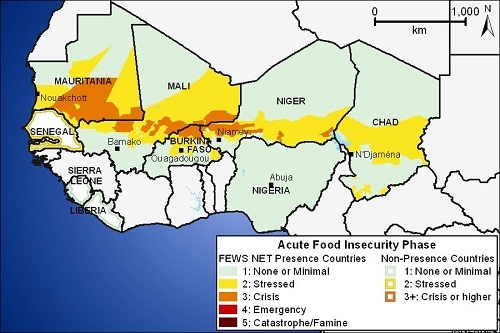 Article first published as Famine Warnings: Alarming Hunger Crisis Demands Quick Action on Blogcritics.